Before Marvel NOW, Deadpool was a character in need of a reboot thanks to massive overexposure. With at least three ongoings, multiple mini-series, numerous guest appearances, membership in X-Force and a variety of cover initiatives, Deadpool either equaled or surpassed Wolverine’s heights ... and at the same time, experienced a huge variety in quality. The line-wide revamp reduced this back to one title with a new creative team (along with a team slot on the Thunderbolts, which makes sense considering that team’s new status quo). The issues collected in Deadpool: Dead Presidents feel closer to the glory days of Joe Kelly than any story featuring Wade since the early volumes of Fabian Nicieza’s Cable and Deadpool. For the new writing team, the unusual choice of Gerry Duggan and Brian Posehn ended up working wonders. 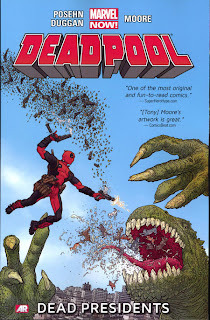 Duggan is a relative newcomer, and while Posehn is a well-known comedian and comic book enthusiast, his comic book work previous to Deadpool was limited. One advantage of writing a funny comic book as a team is that you have someone to bounce the jokes off of before they reach the page. Much of the humor works, and while pop culture jokes based on, say, We Bought A Zoo might be lost on readers in a few years, they fit well into Wade’s sense of humor. The undead version of Gerald Ford literally stumbles to his death a la Chevy Chase’s impersonation of him from Saturday Night Live, so pop cultural half-life is always subjective. Ford and all of the other dead presidents are the villains for this volume, which has a fairly simple premise. A crazed S.H.I.E.L.D. agent has raised them from the dead to fix the country ... but they came back as insane and evil versions of themselves. Captain America’s defeat of F.D.R. creates some negative headlines; as a result, S.H.I.E.L.D. needs someone who can take out the presidents without linking the effort to the United States. Deadpool is crazy and unkillable enough to do the job. The concept admittedly runs out of steam after a while, and at points, it feels like Duggan and Posehn are stretching out the book for an artificial six-issue trade. They compensate for this with crazy schemes by the ex-presidents, such as Teddy Roosevelt hunting in the Los Angeles Zoo and Ronald Reagan trying to activate a Russian missile satellite. Amongst the beneficial changes made to the character for this new title was the jettisoning of the “second voice” in his head. Deadpool has often conversed with the yellow narration boxes, but Daniel Way introduced white caption boxes with a more dismissive and critical voice. This got annoying after a while, both by cluttering up the panel space and by reducing Deadpool’s interactions with other characters. Unfortunately, the current iteration still lacks in strong supporting characters. The ghost of Ben Franklin is on hand to provide exposition and Deadpool’s S.H.I.E.L.D. handler, Agent Preston, keeps him on track, but they’re not particularly interesting. Even when Madman, the magician who raised the presidents, is added to the heroes’ side, he’s more of a kooky McGuffin than a character. Deadpool needs a more serious character to work with, whether it’s Weasel, Siryn, Cable, or even Bob, Agent of HYDRA, and this is especially true now that the white boxes are gone. Duggan and Posehn correct this problem in the middle of the book by teaming Deadpool with Doctor Strange, and the two characters have some hilarious interactions. Strange is written as perfectly smug and aloof, yet able to drop a perfectly timed Arrested Development quote in mid-battle and mention Ben Franklin sleeping with his wife Clea back in the '70s. It’s entirely possible that the best route to go with Deadpool is a rotating guest star slot, which worked with Deadpool Team-Up. By far, the strongest part of Deadpool: Dead Presidents is Tony Moore, who most famously co-created The Walking Dead. Much like Wolverine, Deadpool has a strong healing factor, which means that he gets grievously injured every few panels because he can take the damage. Moore uses this opportunity to add in lots of blood and guts along with the rotting corpses of the dead presidents. It’s made explicit that these aren’t really the bodies of the presidents; they’re just ghosts, many of whom are filtered through popular interpretation. William Howard Taft, for instance, flies around in a tub due to the most famous story about his girth getting him stuck in one. Wade also spends a lot of time maskless, and Moore is able to draw him with the proper amount of horrifying facial tumors. There’s one weird artistic moment that I’d like to mention. At one point, Deadpool jumps from a moving plane to land on the Golden Gate Bridge and confront a group of minor dead presidents and the Tea Partiers supporting them. When we next see Deadpool, he’s ... on top of an airplane rising up to confront the presidents. Did he jump from the plane and make a dynamic entrance just to run away and make a different dynamic entrance? Or did time pass and that not get conveyed properly? Another issue is my inability to access the Marvel AR extras. My phone isn’t able to operate the app properly. I really wish that these came with special codes to download or access the videos on Marvel.com, especially since I don’t use my phone’s app capabilities all too much and I don’t own a tablet. While Deadpool: Dead Presidents has its share of problems, they’re minor overall. The end of the book indicates a cast change coming soon and I can’t blame Duggan, Posehn, and Moore for the technical issues with Marvel AR. In a cool concept, the next trade features the idea of “lost fill-in issues” taking place before Deadpool was technically created, having him interact with '70s Luke Cage and '80s Tony Stark, for instance. I look forward to those; for now, Dead Presidents is a good start.